Our family was distressed to hear that Paul Walker, an actor best known for his role in the Fast and Furious movies, died in a car crash. He was our celebrity! While it seems from magazines and the internet that Southern California is just crawling with celebrities, they certainly aren’t out where we live. So it greatly amused our family when Youngest Daughter had a brief brush with Paul Walker back in 2009. Youngest Daughter had fun when she went to a Hurley fashion competition between four area high schools, including her own high school. One of the judges was an actor named Paul Walker, someone Youngest had barely heard of since she had never seen “Fast and Furious.” After the show was over, Mr. Walker was walking past Youngest and her friend when a group of girls decided to start chasing him. In order to escape his fans, Walker broke into a run, pushing past Youngest and her friend in the process. Youngest went to school the next day and told all the girls that Paul Walker had pushed her! High school girls being high school girls, they all corrected her and told Youngest that Paul Walker had TOUCHED her. Needless to say, they were all jealous. It is the day after Thanksgiving. It is also Black Friday and the official start of the Christmas season. So take a deep breath. 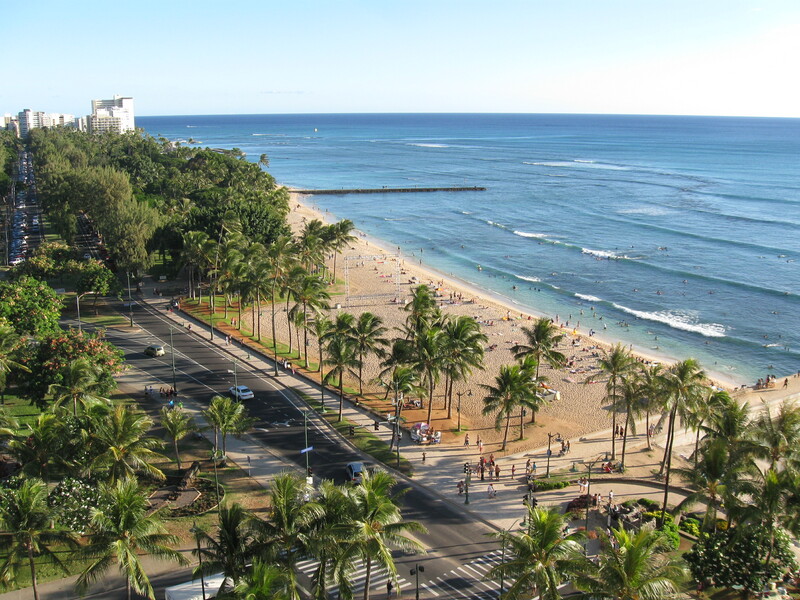 It will be OK. Just enjoy the photo below of Wakiki Beach in Honolulu and pretend you are on vacation for a few minutes. Feel free to come back and stare at this photo any time you need a break this weekend! 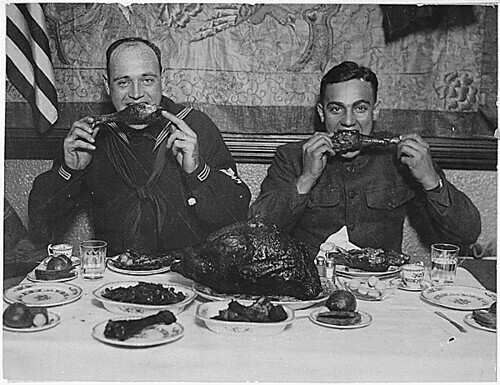 Wishing all of you a Very Happy Thanksgiving! May your turkey be moist, your gravy hot, and your mashed potatoes smooth and creamy! It has been 18 years since I had a toddler in the house. But not to worry, my elderly dog is trying her best to recreate the toddler years for me. The other night, for some unknown reason, I woke up about 4 a.m. and had trouble getting back to sleep. I finally turned on the light about 4:30 and read for half an hour. About 5 I turned the light back off and looked forward to getting another hour of rest, and maybe even sleep, before the alarm went off. Very soon after that Hubby, who has been buried in work, left the house and this disturbed Honey the dog. And so the sound of dog toenails on wood flooring began. Pace pace pace. Click click click. I finally dragged myself out of bed and she was so happy to see me, like she had nothing to do with my awake state at that time of the morning. It was that same happy face I used to see when one of my daughters would get me up during the toddler years. You know, that “I am so happy you are awake, too, Mommy!” joy that lights up their face when they force you out of bed. After putting the toddler, I mean the dog, out, I settled in for a good long read of the newspaper. After getting up so early I had plenty of time! Anyone been at a hospital lately? I don’t know what they do outside of Southern California but here you have to get a paper bracelet in order to leave the waiting room and go to the room of your loved one. Hubby’s mother has been in the hospital and so our collection of paper bracelets covers the colors of the rainbow. Everyday we speculate what the color will be. Anything to keep our minds off what is going on up on the 4th floor. I have had to make lots of tough decisions in my life and Hubby has been right there by my side. But now it is his turn. It puts my in a weird position. Before, I was the one making the decisions and he was offering advice. Now he is making decisions and I am relegated to the advisory role. FYI, neither role is a good one. I struggle with having to watch Hubby struggle with the difficult decisions. I struggle with watching my twenty – something daughters confront, for really the first time in their lives, the pain of watching death come, and I know that the pain will get worse for them before it gets better and there is little I can do. I struggle with the fact that the last 22 Christmas Eves have been spent in my mother in law’s living room and until two weeks ago there was no reason to belive that this year would be any different. But long-held holiday traditions are changing, just like that, and we have just one month to adjust. And then there are all the practical matters. Mail and bills and a house and stuff, lots of stuff. I am trying to be helpful and make calls and do things but I am almost unable to make my brain do any of it. So I blog instead. I feel like I am doing something productive (even though I really am not). All is not lost, of course. There are friends and family. Warm and fuzzy pets. Bad reality TV. Donuts, lots of donuts. Life has its ups and it has its downs. I think it is good to try to keep that in mind at times like this. When I married Hubby, I was given a new last name that is the second most common last name in the United States. (Go ahead, look that up and see if you can figure it out!) This name has connected me with people of different races, creeds, colors, and probably national origins, none of whom I am related to. My maiden name was unusual enough that if I had ever run into someone with the same last name (which I never have) I would have fallen on them like a long-lost cousin. But the new name is everywhere and I don’t even blink an eyelash anymore if I am introduced to a person with the same last name. So, dear readers with more unique names than I, would you have wondered if the two Dr. Nguyens were related? One day when I was in 6th grade I had a piece of hair on the top of my head that was sticking up in a lump that water would not tame. Time was ticking away (it was a school day) and I finally solved the problem by cutting the lump off, as close to the scalp as I could! Well, if I thought the lump looked bad, imagine how it looked a few weeks later when that small section of hair got long enough to stick straight up from my head. Way worse than the lump that originally started the problem! A little mini Mohawk! I learned my lesson and have rarely used sissors on my own hair ever again. Did you ever take sissors to your own hair with less than perfect results? Big stuff, like engagements and babies and winning the lottery, just happen a few times in our lives. But the little stuff, the fun, joyful, pretty and funny stuff, now that happens every day. This afternoon I was finding quite a few of those little moments. Eldest Daughter and I were out running errands today and had to stop by the grocery store. Outside the store was a boy who looked about 12 holding an adorable little white terrier mix dog. That dog was so happy at all the people walking by, he couldn’t stop wagging his tail. So cute! A few more steps and as I stopped to grab a shopping cart I saw a dad and his little girl walk by. She was all dressed for t-ball in her baseball pants, shirt, cap and shoes. But clutched in her hand was a gold princess tiara, a nice big one. I had a chuckle over that. Dad’s little slugger was still all girl! We did our shopping and when we came out the sky was so beautiful! There were lots of clouds which the sun was edging with silver and gold and the beautiful blue sky was peaking through. I took some photos when I got home, not that they do the beautiful sky justice, but here is one. 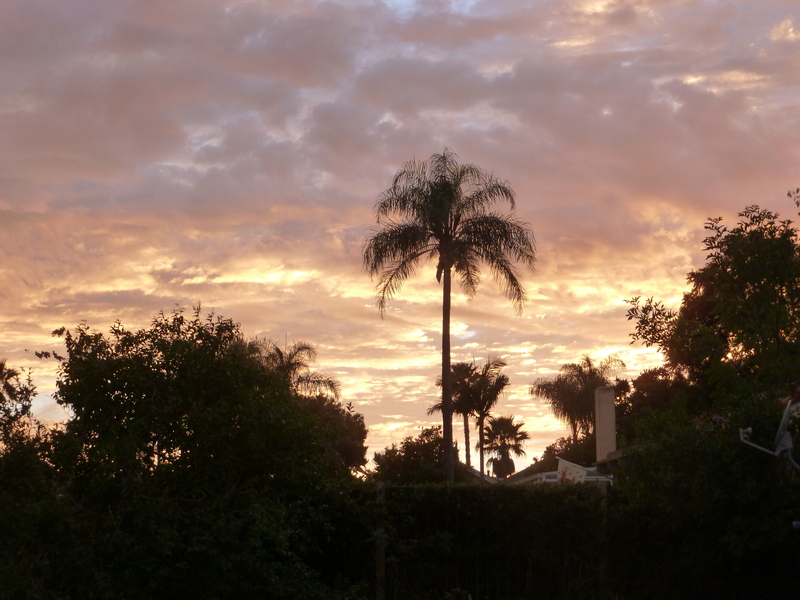 Very California, with the neighbor’s palm trees silhouetted against the beautiful clouds. 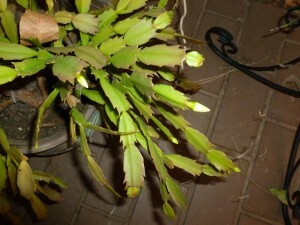 Then, as I was going back into the house I noticed that Nanny’s Christmas cactus is getting ready to bloom. My grandmother had a green thumb, and I do not, but I have managed to keep this one plant of hers alive for the last 14 or 15 years and it really makes me happy when it blooms every year. The little buds are forming, getting ready to give a beautiful December display! I hope that there are some little things making you smile this week! I Never Thought I Would Say That! I live in a city where folks own horses. Not me. But other folks. My city also still has two lane country roads in many places. Yes, there are horses and country roads in So Cal!I Recently I was driving on one of those country roads and up ahead of me was a horse and rider on the dirt shoulder of the road. They were riding next to a fence and behind the fence were a bunch of dogs, all of whom were very excited and barking because of the horse. Yep, the rider was on his cell phone! By the way, I was yelling in my car with the windows up. The horse rider never heard me. Just expressing frustration to myself. The rider had enough problems with the barking dogs, I wasn’t going to add to it! The rider finally hung up and got both hands on the reigns. And I finally got to get moving again. On Halloween night we made our annual pilgrimage to E.J.’s house. E.J. was my mom’s best friend. Everyone thought they were sisters, even though one was a red-head from Arkansas and the other a brunette from Pennsylvania. E.J. made her traditional Halloween pumpkin pie and it was delicious as usual. What was so special about the evening is that E.J. is 91! You wouldn’t guess it to look at her. But then, E.J. has always looked and seemed younger than her years. She never smoked and was eating healthy long before it was the in thing. I sure hope I am whipping out pumpkin pies when I am 91. E.J. is the one that predicted when I would be born. I was due in the middle of December but she told my mom that I would be born on November 25th. That is E.J.’s weddking anniversary and her daughter’s birthday. My mom didn’t believe it because November 25th was so far from her due date. Sure enough. I popped out just when E.J. said I would. Surprise! Well, a surprise for my mom, but not for E.J.! E.J. 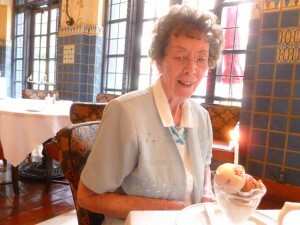 enjoys a birthday surprise when another friend and I took her out for a birthday tea at a local hotel.